That Blue Jeans Guy : Episode 90-Gettin' Schooled! I apologize for the lateness of the episode. Between the weather and the creative bug biting me with the idea of the mashup, I ran over schedule. I'll do better next week. No Child Left Behind needs to be left behind. Illinois passes mandatory moment of silence. Is mandatory prayer far behind? Bay City commissioner gets his behind handed to him by another commissioner's wife, with musical tribute by me. 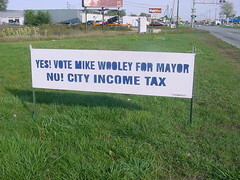 Click here to see the my flickr collection of both candidates' signs. You do want to. My guest appearances on "There Are Some Who Call Me Tim" and "Archerradio" Thanks, guys! Join the political mayhem here! here!